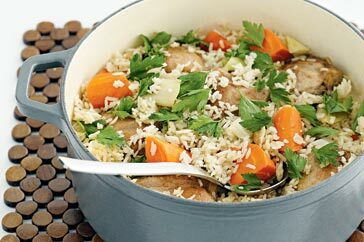 This one pot dinner was contributed by Louise a few months ago, but I’ve only just got around to giving it a go tonight. And I’m so glad I did! This was such an easy, yummy and affordable meal – exactly the kind of recipe this blog is about. Originally from Good Taste magazine, this tasty recipe made oodles and will definitely be one I grab when I next need a fuss free meal for a fair few people. As well as all these things, what I really like about this recipe is the fact that you probably already have all of the ingredients in the cupboard and it utilizes only one pot, so there’s not much washing up. And one more thing: to increase time spent with guests, you can prepare this recipe to the end of step 1 up to 2 hours ahead. Store in the fridge until ready to finish if off. Total cost is around $10 and serves 6+ adult size portions. Place the chicken, flour and Chinese five spice in a sealable plastic bag. Season with pepper. Seal and toss to coat. Heat the oil in a large heavy-based saucepan over medium-high heat. Add the chicken and cook for 2-3 minutes each side or until browned. Transfer to a plate. Add the carrot, leek and garlic to the pan and cook, stirring, for 3 minutes or until the leek softens. Add the rice and stir to combine. Add the stock and stir until well combined. Return the chicken to the pan. Cover and bring to the boil. Reduce heat to medium-low and simmer, covered, for 12-15 minutes or until all the liquid is absorbed. Set aside, covered, for 10 minutes to stand. Season with extra salt and pepper and sprinkle with the fresh parsley leaves to serve. Welcome! My name is Jane and I'm a wife, mother and daughter of God. I love using my time to tell people about Jesus and cook food that gathers people together to glorify him. Here you'll find the recipes and resources I find most helpful: easy to make, modify and budget friendly. If you'd like to contribute a recipe that you've tested and fits these criteria please feel free to send your contribution to foodthatserves@gmail.com.